And down the stretch we come. Just four WSU spring “fish wraps” left, as the 2009 calendar flips to November. And to kick off the final month of the season, WSU heads to Tucson the week after playing Notre Dame in San Antonio (hmmm, maybe they ought to just stay down south and make a week of it?). Nice SI cover from the archives huh? Man, that Desert Swarm D, that was something else to watch. I was at that battle in Pullman in 1994, when the Palouse Posse-led Cougs lost a heartbreaker, 10-7. What a fantastic defensive match-up though, wow. The speed and hitting on both sides was incredible. Of course, that was the game where Mark Fields stripped the ball away from an Arizona running back as the Wildcats were trying to milk the clock, and with under a minute to play, the Cougs got the ball back deep in AZ territory. After a few plays, they were well within field goal range, but the play clock ran out as Tony Truant lined up for the field goal attempt! I still remember the entire WSU sideline screaming for a timeout, but the field goal unit just sort of moved in slow motion as the play clock wound down. Heck, the WHOLE STADIUM was screaming timeout! But we know what happened next – delay of game, five yards back, and the resulting kick never had a chance. Just brutal. But still a pretty entertaining game! Yes, Arizona, where Mike Stoops turned the heat down to a low simmer on his eternal hot seat. Word was Stoops was in trouble if he didn’t get his Mildcats into a bowl game, but he was able to cobble together an eight-win, bowl victory season to keep the villagers at bay. So what to do for an encore? How do they look heading out of spring? Let’s see…. 2008: 8-5, including 5-4 in the PAC-10. They wrapped up ’08 with an impressive 31-21 Vegas Bowl extravaganza over BYU. That’s the same BYU that beat both Washington and UCLA on back-to-back Saturdays last September, so hey, the PAC-10 saved a little face? It was AZ’s first bowl win in 10 years, the last one coming in a Holiday Bowl victory over Nebraska in 1998. But things did look a tad shaky for a while last year. After starting 4-1, AZ would lose four of their next six. But they closed strong, beating ASU big to close the regular season, and then of course, the Las bowl win. FANS ARE: For once, pretty pleased with Stoops. The eight wins was a nice way to cap off Willie Tuitama’s career (and while going undrafted, Tuitama was arrested for “extreme DUI” in March. Tough spring for Willie.) And the expectations are pretty reasonable right now. A lot of people believe that AZ should be a perennial bowl contender, and they might finally be settling in under Stoops. Not necessarily in USC-Cal-Oregon territory, but certainly in that four-to-seven range? LAST TIME vs. WSU: A somewhat uninspired 59-28 win in Pullman. Uninspired in that they failed to score 60? Nah. Uninspired in that AZ came into the game a little flat, and let an over-matched WSU team hang around a little bit. It was 14-14 into the second quarter before AZ turned on the juice to pull away, but WSU scrapped back to make it 45-28 in the beginning of the 4th quarter. But that would be it, as AZ tacked on a couple of late TD’s to win going away. OFFENSIVE SYSTEM: A Sonny Dykes creation in the Texas Tech Red Raider style, AZ threw the ball a ton last year. They love to get into shotgun sets and spread you out, but can beat you with the quick-hitting runs, backs catching it out of the backfield, or splitting coverages with the MONSTER tight-end (we’ll get to him later). ’08 OFFENSIVE RANKINGS: #3 in the conference in scoring offense (36.6 ppg), 3rd in passing offense (244.0 ypg), and #4 in total offense (402.4 ypg). But the biggest improvement – BY FAR – was the running game. In ’07, AZ was a miserable 10th out of 10 in rushing yards per game, just 76.8. Not only that, they were almost 35 yards per game out of NINTH place, behind Stanford’s 111.2 yards per game. But in ’08? Try 158.4 yards per game, a solid fifth in the PAC-10. That’s an improvement of 81.6 yards per game on the ground in one year! That running game helped out quite a bit in improving their scoring per game by over a TD (28 ppg in ’07, 36.6 in ’08). No doubt, a much better offense in ’08. ’09 RETURNING OFFENSIVE STARTERS: Seven, which is pretty strong. But not coming back are some boys with big shoes to fill, including leading passer Willie Tuitama and leading receiver Mike Thomas. TOP OFFENSIVE PLAYER: Running back Nic Grigsby is a really nice player, a 1,000+ running back and a key figure in Arizona’s improvement in the running game. But about that MONSTER tight end…. Rob Gronkowski is the complete package. While he missed three games last year, he still was third on the team with 47 catches. But he was most adept at getting into the end-zone, with 10 TD catches (that’s one per game he played in last year). Those 10 TD catches were a nice progression from ’07, where he had six more as a true frosh. The guy is pretty much everything, and with Mike Thomas now moving on from Tucson, there is no doubt who will get a lot of attention in the passing game next season! And at 6-6, 260, he’s also setting up nicely for a productive career at the next level. DEFENSIVE SCHEME: Your garden-variety 4-3. Not a ton of blitzing, but they have a talented group of defensive linemen coming back in ’09, so it may not be necessary anyway to get pressure. 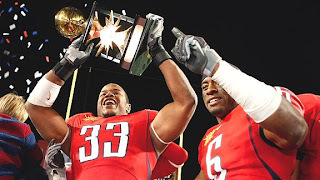 ’08 DEFENSIVE RATINGS: Arizona was #3 in the conference in scoring defense (21.3 ppg), #3 in total defense (313.0 ypg), #5 in rushing D (131.1 ypg) and #4 in passing defense (181.9 ypg). A decent defense that improved literally across the board in all the major categories from 2007. ’09 RETURNING STARTERS: Seven, including the front-line guys on the defensive line and key players in the secondary. The big losses are at linebacker, led by all-everything tackler Ronnie Palmer. TOP RETURNING DEFENSIVE PLAYER: This one is kind of tough. Defensive end Brooks Reed had a big junior year last year, with eight sacks and 10 tackles for loss in ’08. He was by far the biggest pass-rush threat on the defense as a sophomore. And freshman DB Trevin Wade came up big in his first season last year, leading the team with four interceptions. 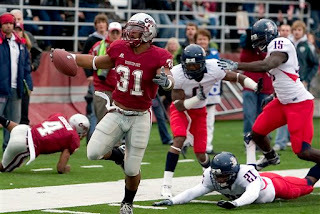 But I’ll go with the senior corner, Devin Ross, as the top defensive player coming back in ’09. Ross was second on the team in ’08 with three INT’s, and was tied for 6th in the conference in pass-breakups with 13. A pretty complete corner, Ross also had 50 tackles. He was a second-team All-PAC-10 selection last year, and will likely be in the discussion as top returning corner this year. He’s not afraid to stick his nose into the action and even though he’s not a huge DB (5-11, 170), he won’t back down. Ross stepped into a difficult situation last year, taking over for departed four year starters at corner in Antoine Cason and Wilrey Fontenot, but he more than held his own. With Robert Golden moving off corner to one of the safety positions, Ross will likely team up at corner with rising sophomore Trevin Wade, who led the team in interceptions last year with four. They should have a top-shelf secondary in ’09, and Ross will be a huge part of that. 1) HOW ABOUT THE QB? You knew it was coming, but yep, Willie Tuitama’s time has come to an end in Tucson. Tuitama capped his career off in style, beating BYU last year and throwing for over 300 yards in the game. Tuitama threw for over 3,000 yards last year, the second consecutive season he topped the 3K mark in the passer-friendly spread offense at AZ. Overall Tuitama threw for over 9,000 yards in his career, the top all-time at Arizona. Yes, he’ll be missed. That said, time to turn the page. Right now the QB derby is still in full swing, as QB’s Matt Scott and Nick Noles are tight coming out of spring. Scott has a little game time under his belt, but not a whole lot, just 84 yards last year in extremely limited time in ’08. Scott (pictured) can move though. Not the pure thrower in the mold of Tuitama, Scott ran for 188 yards last year in his short time on the field, averaging 8.2 yards per carry. The word from Teddy Miller was that Scott has the slight lead over Noles coming out of spring, but it’s likely both could play early in the season as they try and figure everything out. 2) THE SCHEDULE? Pretty reasonable early, tough as nails late. They host Central Michigan and Northern Arizona to open the season, and then they are off to Iowa for what could be a difficult road game. They close September by heading to Corvallis, taking on the Beavs in their PAC-10 opener. All told, they have five PAC-10 road games. November looks tough as well. After hosting our Cougs on 11/7, they go to CAL, are home for Oregon, then close the year by going to Arizona State and at USC on 12/5. It’s not hard to see AZ get off to a hot start, at least well into October, but the season will be all about what happens in November. 3) How GOOD is the defense? Pretty good actually. Not exactly Desert Swarm good, but maybe the best defense they’ve had in several years. They improved across the board in ’08, and have a lot of talent and experience back on the d-line and of course, in the secondary. But they do need to pick it up a bit in the pass-rush department. Even with Brooks Reed and his breakout ’08 season, they still were middle of the road in the conference with 24 sacks. More will be expected out of the men up front. With a couple of new starting linebackers in the mix, they will need to have a big year on the line to keep the heat off the new guys. WSU Football Blog SEZ: Arizona was one of the breakout teams that everyone liked last year (including us!). Senior QB, tons of starters back on a complex offense (10 last year), etc, etc. It looked like a strong pick early in the year, but they really wobbled in the middle of the year. However they did put it all together late, and ’08 turned into a nice success. Everyone knew they would move the ball last year. But the big surprise was the improvement in the running game. Nic Grigsby averaged 5.4 yards per carry, and true frosh backup Keola Antolin added over 500 yards as a nice one-two punch. The team had 33 rushing TD’s in ’08, a huge improvement over ’07. And with that strong running game, things are going to be different in ’09. Like many PAC-10 teams for next year, the emphasis is going to be on the running game. And why not? With Grigsby and Antolin returning, along with experience on the O-line, the fantastic all-everything TE Rob Gronkowski, AND a brand new QB? 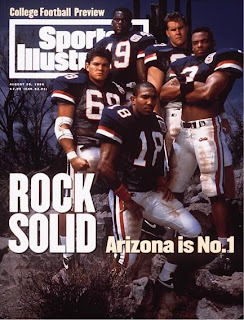 Get ready for an older-school Arizona attack, where they will lean heavily on a strong ground game and an experienced, physical defense to carry the day. That’s it for today. ENJOY YOUR FRIDAY, and as always….GO COUGS! You are currently browsing the archives for the Brooks Reed category.